The folk-rock singer-songwriter took home three Grammys, including Best Americana Album for 2018's "By the Way, I Forgive You" and Best American Roots Performance for that LP's first single, "The Joke." Her most poignant remarks came after picking up the award for Best American Roots Song for "The Joke," which she also performed live at the ceremony. "Americana music is the island of the misfit toys [and] I am such a misfit," Carlile told the crowd. "I came out of the closet at 15 years old, when I was in high school, and I can assure you that I was never invited to any parties." "I never got to attend a dance," she continued. "To be embraced by this enduring and loving community has been the dance of a lifetime. Thank you for being my island." Watch Carlile's full speech below. 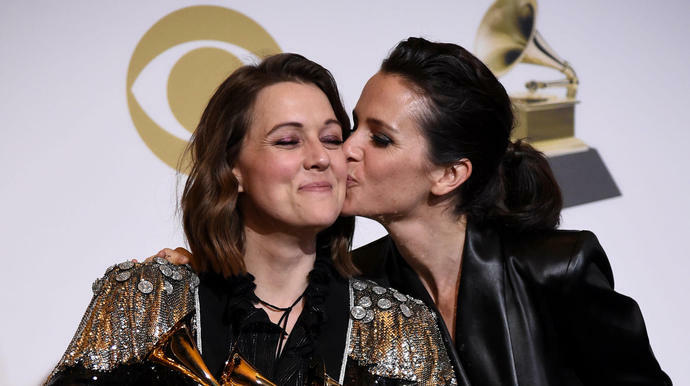 Carlile ― who has been married to wife Catherine Shepherd since 2012 and is based in Seattle ― had previously expressed her gratitude at being the 2019 Grammys' most-nominated female artist, with six nominations in total. "I feel like I've always been on the fringes of mainstream acceptance like that, but it means the most that I've received this honor at this point in my life," she told Variety earlier this month. "Being a 38-year-old mom, with two kids, who's gay and lives on a farm, and is nominated alongside Janelle Monáe and Cardi B, it's kind of unbelievable." In an interview with GLAAD from the Grammys red carpet Sunday evening, she said she was "here to represent" the LGBTQ community as a whole, while acknowledging other queer artists who'd come before her. "This is all of our honor," she said. "On nights like these, I'm reminded of the way that's been paved for me by Ellen DeGeneres, the Indigo Girls, Elton John, Freddie Mercury, Joan Armatrading and George Michael." "I'm stunned speechless at the opportunity to be representation for some other kid in some other small town," she added.